QUESTION: Mr. Armstrong; I have been in the industry for more than 30 years. There is nobody who has called the shots better than you and your numbers are absolutely amazing. You said the ECM should make at least a temporary low in the Dow and that it did. It bottomed the day before which has demonstrated whose dates are being copied by others. The October 7 was blatantly an attempt to copy your model exposing the sad state of affairs in analysis. But now you say the top here is 17732 and that must be exceeded or else we turn back down. So getting through that level suggests the Phase Transition first and bouncing off warns of a slingshot move breaking the August low and then running to new highs next year. ANSWER: Yes. We are moving on the Dow to test resistance after bottoming with the ECM. The week before, the number to hold was 16280. 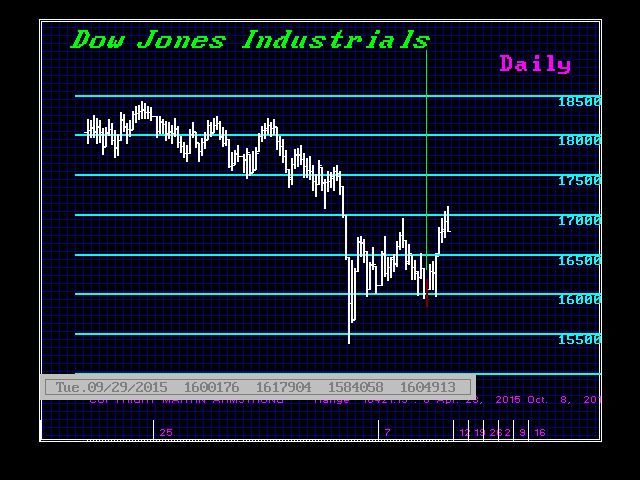 The market rallied that Friday’s close and held that number after being beneath 16000. Now, the overhead resistance starts at 17500 and moves up to 17735. Today, we reached about 17140. A failure to get through this zone will then turn our focus to the support. If we hold that again, then it is consolidation quiet-land before the Phase Transition. The Dow reflects the global investment trend. The S&P 500 is dominated by domestic institutions and NASDAQ is dominated by retail. So each index has a slightly different pattern and reflects a different part of the trend.